The beginning of seventh grade marks a special milestone for Norwood students. As they move on to the 7/8 hallway, they meet the teaching team they’ll work with until they graduate. Seventh graders participate in numerous community service experiences all over the DC-metro area with their advisory groups. In history, students embark on a two-year journey through the 20th century, examining it chronologically, thematically, and culturally. Early in the year they take an overnight trip to Philadelphia, visiting several American history sites as they prepare to examine the role of the United States in world history. Immigration, migration, the impact of scientific and technological advances, the motivations and strategies of war, daring initiatives for peace, the spread of democracy, and economic challenges are among the issues examined on a scale that ranges from global to individual. Students’ history studies are often linked to literature they explore in their English classes, with an emphasis on diverse authors of the 20th century. They compose analytical, expository, and creative responses to their reading on a frequent basis in addition to engaging in a wide range of other writing experiences. In science, seventh graders integrate elements of geology, chemistry, and biology into an intensive first-semester study of water and explore the relationship between motion and forces during a second-semester physics unit, all while engaging in experiments and considering current issues affecting their lives. In math, they study a course of either pre-algebra or algebra. Seventh graders choose from elective courses in visual and performing arts and technology, including digital design and courses in coding. While participation in the wonderful fall play and spring musical is optional, all students continue to practice and perform in an instrumental or choral ensemble. In physical education, they participate in the interscholastic athletic program, an outdoor education program called Summit, and strength and conditioning. In seventh grade English class, students approach their study of literature through a thematic perspective, asking questions like, “How do individuals preserve their cultural identity and find their voices in society?” Students read texts closely and critically and produce analytical, expository, and creative responses to those texts. Among other texts, students take a deep dive into To Kill a Mockingbird, engaging in a close, detailed reading of the book. With small class sizes, teachers lead students in Socratic-style discussions of themes and issues. Using a diverse and wide selection of texts, students demonstrate their learning through a variety of projects and assessments, including literary analysis, scriptwriting, filmmaking, poetry, and letter writing. In seventh grade, most students enroll in pre-algebra. The course is taught in two levels, regular and honors. The course is a rich exploration of topics in pre-algebra and builds on the foundations developed in prior courses. The main differences between the two levels are the pace of curriculum progression, depth of topic discovery, and independence in problem solving expected from students. Seventh graders continue to study history in the United States with a focus on multiple perspectives and primary resources. They begin with the early Republic, moving through the Civil War and Reconstruction, and conclude with the end of the 19th century. Along the way, they study the individuals and events that helped to shape the United States. Through research projects, discussions, class trips, and debates, students explore the issues that continue to impact us today: labor unions and corporate interests, progressivism, immigration, populism, segregation and integration, and imperialism and the emergence of the US as a global power. Students learn how to unpack complex problems and conflicting viewpoints and desires to develop deep understanding that shapes their own beginning worldview. Seventh grade students work primarily in a lab setting. Lessons continue to be grouped in units, but students do the bulk of their work with lab partners as they explore the content of the lesson. Completing 2-3 small labs per week, they practice gathering data, analyzing it, and drawing conclusions. In addition to these weekly experiments, students complete larger, longer term experiments such as: Dr. Snow’s Broad Street Outbreak Simulation, the Silver Oaks point-source contamination simulation, and the material/physical science Eggsalent Car Crash Challenge. Through all of these, problem-based and inquiry learning drive the curriculum and challenge students to apply their knowledge to solve problems. The seventh and eighth grade Spanish program includes the study of history and events from Spanish speaking cultures and has the goal of expanding the students’ abilities to express themselves accurately in oral and written Spanish. Students are exposed to authentic sources of Spanish via online recordings, songs, videos, full length films, and news sources. They read a wide variety of materials written for native speakers and for language learners. The students conduct research, write compositions, sing traditional and pop songs, act in skits, and do oral presentations in the target language. In seventh grade, students participate in a field trip to a cultural institution such as the Organization of American States or the Mexican Cultural Institute. Both seventh and eighth grade Spanish students take the National Spanish Exam. Seventh and eighth grade levels provide opportunities to develop communication skills in the language, at an emerging level, while deepening the understanding of the people and culture of China. The target language is used almost exclusively in the classroom to work toward proficiency in listening, speaking, reading, and writing. Topics include: foods, clothes, body parts, sports, animals, transportation, shopping, languages, weather, and making comparisons. Class activities include short essay writing, research projects, implementation of language-related web activities, use of Kuaiban (“bamboo talk), discussion of current events, use of a variety of authentic Chinese materials, and visits to Chinese cultural centers. The seventh and eighth grade French curricula focus on theme-based units that cover more complex grammar concepts as well as new conjugation tenses (perfect tense, future, and conditional). Students read at an intermediate level getting a taste of genuine French literature such as La Tulipe Noire by Alexandre Dumas, 20,000 Lieues sous les Mers by Jules Verne. In seventh grade, students research important places in France through Le Tour de France Culturel. Beginning in seventh grade, students have the option to switch their world language course to Latin. During the next two years, they learn Latin through the study of language structure, vocabulary acquisition, and translation. They are encouraged to make comparisons to the grammar structure of English which gives them great insight into their own language. Through vocabulary, students learn that many English words are derived from Latin words, and they learn to decode more complex English words by looking for the Latin roots. Students study Roman culture to put the Latin language into the context in which it was originally used. The culture studied is incorporated into the translations and story lines to make the passages more authentic. Language and culture are integrated from the outset by using as much authentic Roman subject matter as possible. In the seventh and eighth grades, students expand their knowledge of the elements and principles of art and continue to explore art as a visual language. Students chose two courses in art each year and each course concentrates on one medium. The students work with various materials and learn techniques within that medium. They work both from observation and from visual memory. The art courses draw on a wide variety of ideas, artists, and art to inspire the students and help them understand and appreciate the diversity of artistic expression. Exploration, problem solving, artistic expression and self-discovery form the frame work that guides our art projects. We strive to educate an artistically competent, adventuresome and confident student, who is generally comfortable thinking outside the box in all areas of study. Students learn computer illustration techniques, image manipulation, digital camera use, and how to apply the principles and elements of art in a digital composition. Through the creation of posters, logos, digital paintings, and graphic designs, students become familiarized with the tools, layers, and filters in the programs Adobe Photoshop and ArtRage. Students use their graphic and artistic skills to design and produce the yearbook using an online publishing program. In drawing class, students explore the use of various drawing materials from charcoal to pencil to pastel and ballpoint pen. Each material has its strengths. They explore texture, tone, pattern and color. They learn to manipulate space creating a deep landscape space or a flat abstracted space. Students learn to express emotions and express their own feelings. They learn the power of composition and what changes in scale can do to the impact of an image, as well as develop comfort with drawing. The painting class places a strong emphasis on color, mixing colors from a limited palette, understanding how to use complementary colors to create shadows and creating color combinations that enhance each other. Understanding of composition and structure are also emphasized. The class paints landscapes, still lives, portraits and abstract pieces. The printmaking course is designed to teach fundamental relief-printmaking techniques. Students produce prints using a variety of techniques and materials and they learn to prepare blocks, use carving tools and print by hand and on the press using water-based inks. Also covered are methods for creating reduction prints and alternative techniques, such as collage and hand-colored prints. Students learn to number and sign editions of prints and develop vocabulary of printmaking terms and techniques. The conscious use of elements and principles of art is encouraged in designing prints. Drawing and color-mixing techniques are an integral part of the course. The sculpture class is materials based. Students are introduced to the basic tenants of sculpture, structure, composition, movement, color, pattern and design. Each project involves working with a different material and discovering its qualities and what type of sculpture it can become. Some of the materials that the students work with are wood, wire, tin, found objects, things found in nature and soap stone. Students explore materials such as canvas, yarn, wire, clay, wood, found objects, cardboard, and paper to produce 3-D mixed-media works of art. Students explore the representational and abstract qualities of form to produce free-standing or high-relief works of art. Students also have the freedom to choose from various materials to produce mixed-media weaving projects and fabric painting. Drawing and color mixing techniques are an integral part of the course. In seventh and eighth grade, students my choose to continue their study of orchestra, choir, and band or may choose to play the handbells. Building on the general skills students learned in lower school classes, these tracks apply students’ musical understanding to specific musical areas. While some students have prior experience with instruments, no experience is required and students are encouraged to stretch their musical abilities. Each group participates in seasonal concerts throughout the year, including a winter and spring concert. Orchestra members begin their study with proper techniques particular to their instruments, note and sight reading, learning to play as an ensemble, as well as basic music theory. Throughout their time in the orchestra, students’ build their skills year-to-year as they play musical selections from a diverse set of musical styles, from a range of cultures and religions. Importantly, as an ensemble, students learn to work collaboratively as a musical unit. Curriculum for the course extends the skills and concepts introduced in general music classes in the lower school. Playing a diverse range of music, students begin with fundamental lessons in particular instruments; as they develop competency with those, they are encouraged to branch out to work with other band instruments. As with the orchestra, skills build year-to-year and students participate in seasonal concert opportunities. Middle school choir builds habits that lead to successful performance. Students continue to develop a healthy vocal range and an aural image of good singing, while working on musicianship skills by solidifying their understanding of basic musical notation. Students continue to actively perform diverse musical selections that push them to develop a broad range repertoire of abilities. The selection of those pieces comes in part through student input. As the class learns about and discusses music from different cultures, eras, religions, and composers, they, in collaboration with the instructor, select performance pieces. Beginning in seventh grade, students have the choice to participate in the bells ensemble, the Norwood Ringers. Building on the musical skills they have learned in earlier classes, students apply them to an entirely new instrument; they learn healthy ringing techniques, practice reading musical notation through daily sight reading, and learning the context of the era of their music selections. As with the other ensembles, students learn to collaborate as musicians to bring out the best in one another as performers. Improvisation class is another trimester course. Students use the body, voice, and imagination to create original characters and scenes in a collaborative and supportive environment. They learn how to properly warm up the body and focus the mind for acting. Emphasis is placed on playing drama games that encourage spontaneity, creativity, ensemble acting and characterization. Students also learn basic acting skills through the study of pantomime and original scene building. In Scenes on Stage, students explore how to use the body and voice expressively through scripted work. Students participate in warm-up activities and drama games that encourage relaxation, physical control, and concentration. Emphasis is placed on building a trusting environment where students can collaborate and take risks in their acting. Students learn about character objective and motivation, and they search for the clues in a script that help them make choices for their characters. Students also practice rehearsal skills and perform short scenes and a monologue for the class. Filmmaking is a highly collaborative class in which students watch, discuss, review, and create films. Students are introduced to filmmaking terms and techniques using an online visual glossary and interactive learning tool. Each day students learn new filmmaking techniques and experiment with these techniques through a series of quick small projects which highlight different aspects of filmmaking: image, sound, story, character, setting, structure, mood, theme, and point-of-view. Students work together in small groups as a production team on two main projects: a silent film and a three-minute original short. They write scripts, draw story boards, direct, produce, and edit their projects using the filmmaking software, Power Director. Athletics and alternative offerings provide Norwood students with the ability to be involved in a combination of activities – ranging from traditional sports such as soccer and basketball to more exploratory choices such as strength and conditioning and Summit, our signature outdoor education program. All of these experiences provide students with leadership opportunities, personal goal-setting, and life-long fitness skills. Building on the lessons from the lower and middle school P.E. classes, each sport and/or team focuses on sport-specific skillsets along with social development, personal improvement, teamwork, and sportsmanship. The program includes approximately 25 teams throughout three seasons. Each team practices four days a week for roughly one hour per day not counting games, field trips, special contests, and tournaments. In seventh and eighth grades, students refine and build upon the skills and knowledge they’ve covered in earlier grades. The location of the Middle School Library on the seventh and eighth grade hallway makes it a hub of their school experience; as many of their assignments and projects require original research as well as peer-to-peer collaboration, the library supports many aspects of students’ academic work. Technology instruction continues in support of and is woven into the curriculum of other classes. Furthering students’ knowledge of computer science, a class on coding is offered as an elective. Students are welcome in the library before school, during lunch, recess, and study halls. Seventh and eighth graders also enjoy organizing and leading pizza lunch book clubs throughout the year. Coding Workshop is a trimester course and elective for seventh and eighth graders that explores elements of computer programming and develops the skills necessary to be a successful “coder.” Students develop computational thinking skills to address problems, develop their own sense of time management and organization to create a working program, and build persistence as they learn beginning languages. They use programs such as code.org, SCRATCH, and codecademy to build their understanding of coding. Specific topics for middle school students include nutrition and fitness, personal safety, hygiene, puberty, the reproductive system and reproduction, decision-making, stress management, interpersonal skills, social media, peer pressure, peer relationships, substance abuse prevention, identity, stereotypes, bias, discrimination, and positive action. Depending on the grade and topic, coordinated instruction occurs in homeroom, advisory, science, physical education, and/or dedicated life skills classes. At all ages, the program establishes skills and strategies for lifelong well-being and promotes caring for the well-being of others. Throughout the program, teachers emphasize the important role students’ own family members play in guiding goal-setting, problem-solving, and decision-making. Each morning starts with a community gathering to focus on the value of the month and to prepare for the day ahead. 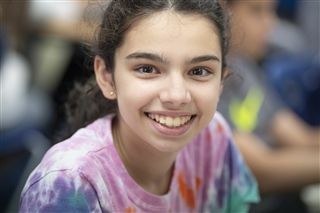 Seventh graders then enjoy a balanced schedule combining history, world languages (Spanish, Chinese, French, Latin), Coding Workshop, English, recess, math, science, music (strings, band, chorus, handbells), Life Skills, and study hall. Tyler School of Art - B.A. Georgetown University Law Center - J.D. Virginia Polytechnic Institute and State University - B.A. Carnegie Mellon University - M.A. Western Michigan University - B.F.A. New York University - M.A.